Come one, come all! There`s always something to do here in Panama City Beach. We have all the watersports you dream about, more golf courses than you can count and everything in between. Panama City Beach is now a premier shopping area. From shoes to clothes to beach souvenirs or that one of a kind present, you can find evertything you need and never have to leave the beach. 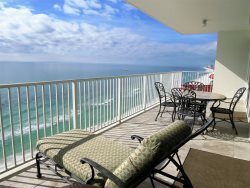 Whether you`re ready for that deep sea fishing adventure or just ready to cook and eat some of the best seafood on the beach, everything can be found just minutes from your condo. Most of Panama City Beaches charter fishing vessels are located in Grand Lagoon off of Thomas Drive. Several seafood markets are also located nearby. Just check it out! Check out all the events happening here in Panama City Beach. More fun for you and your family!